So long, boring black suitcase. There is nothing worse than waiting at baggage claim and keeping a close eye on all the emerging luggage until finally, you spot—oh wait, that’s not your plain black suitcase. Some travel accessories can tend to look uninspiring, opting for function over form. But we believe that everything in your life deserves to showcase your own personal style, and that’s why Away’s brand-new Nordstrom collaboration is so exciting. 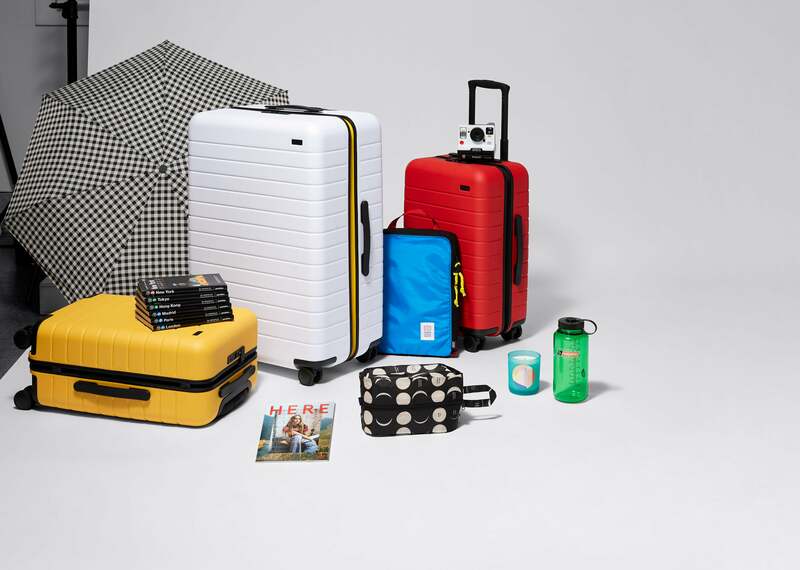 Offering Away’s trademark suitcases in three vivid primary colors, along with a curated collection of pretty travel accessories (think: innovative travel pillows and toiletry sets), the new Pop-In@Nordstrom is a must-stop shop for any jet-setter. The pop-up runs online and in a few select stores until February 24, but if you have an eye on one of the Nordstrom-exclusive suitcases, you should act fast: They might sell-out. If the red, blue, or yellow options don’t totally tickle your fancy, keep your eye out on January 22, when two new colorways (black or white shells with zippers in the primary colors) drop. If you’re not ready to invest in one of these smart suitcases, there are plenty of other ways to upgrade your travel details (without shelling out for a flight upgrade). Suitcase stickers by Mr. Kiji offer a fun personalization option, and a wide array of travel games and trinkets make the journey just as fun as the destination. Shop our edit below! Guaranteed: You won’t miss this bright yellow bag in baggage claim. Royal blue makes for a simultaneously relaxing and energizing option. Opting for a red suitcase is most definitely a power move. Finally, a Parisian luggage accent that doesn’t feature the Eiffel Tower. You never know when you might need a tote. These ones fold up small enough to stash virtually anywhere. Bring your own personal taco truck around the world. For light sleepers, this eye pillow is a total game changer. If you travel with bulkier camera equipment, stash your stuff in this protective cube and you can get the shot at a moment’s notice. Skip the boring plastic bags and put your toiletries in a cheeky, printed pouch. No snooze-button here: This portable alarm clock turns off when you flip it upside down. Even if you don’t have a vacation coming up, you can still make your home smell like an Italian escape. Pass the time on layovers with a pretty, travel-inspired set of dominos. Behold all the toiletries you could need on a long, tiring flight.